I have a new obsession. Airstream travel trailers. I love these things and I was stoked to see that various people and organizations are doing custom interiors that are far superior to the standard "grandma's family room" standard interiors most RVs come with. Airstream - Perhaps the best option and probably the most affordable is the International CCD versions available from Airstream itself. I like the smallest 16' version. With interior similar to this in the 22' version. There is a large lifestyle marketing opportunity here. 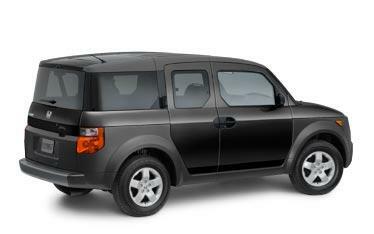 Auto makers are going after the GenYers with active outdoors lifestyles with vehicles like the Honda Element. These small SUVs should be enough to tow a 16' Airstream on expeditions to the beach, the woods, the slopes, the concert, the NASCAR track or even the skate park. A lot of 20 somethings have grown up traveling in their parents or grandparents "uncool" RVs. They would be a ripe market for decidedly cool RVs. They may not yet have the money to purchase an Airstream like these but they would rent one for a weekend outing. What if a Snowboarding company offered branded rental "snow bullets" in ski country? What if a mountain bike company offered branded "riders roosts" to take with to the woods for a weekend of trail riding? An MP3 compatible stereo, a flat screen satellite TV system, a DVD player and a WiFi Internet connection and who wouldn't want to spend a weekend in one of these. It's all about image. 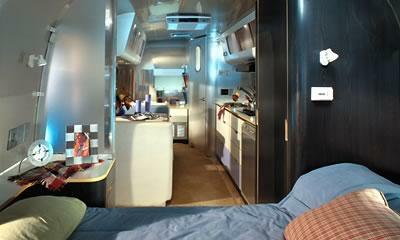 If the RV manufacturers hope to develop a younger customer base high style interiors are a must. Designs to appeal to both the 20 something GenY crowd and the aging very healthy Baby Boomers who want to stay young are the hope of profits for the RV industry. They need to get about marketing and let people outside the RV subculture know that they have some cool offerings. It's gonna be a great future. I sare the same obsession. I'm leaving "gebaudesraum" and travelling into a parallel universe: I plan on living in one. The great challenge is doing it here in the city! I love these trailers, too! I loved them so much I acutally BOUGHT one (an old 1965 Caravel) and now have it in Denver ready to upgrade and restore. It is quite a challenge since I know nothing about this project, but, hey, am learning more every day. One of my ideas was to eventually use my trailer to rent out (along with my services) for promotional events such as races, parades, sport tail-gater type parties and other public events where there are commercial promotional possibilities with radio stations, local manufacturers, senior citizen groups... anyway WATCH the Apprentice Thursday 2/17 to see candidates compete to create successful businesses inside Airstream trailers! i LOVE airstreams. they are a bit pricey though compared to their uncool counterparts. i would love to have one as "high end" as these; WiFi, flatscreen, MP3 compatible, etc. however, i just can't justify the expense right now in my life. do you know of any other companies that are offering "cooler" RVs that don't have all that cheap looking wood veneer and frosted glass mess? This is my first attempt to post a comment on this site and I have Airstream fever too. I try to resist such materialistic ridiculousness, but it is what it is (a passion for things I find emotionally satisfying). Coolest thing ever are these vintage trailers they rent out in Huntington Beach, CA. We rented the Caravel Lounge to host my husbands 50th birthday with a "martini-lounge" theme. It has all the modern conveniences like a flat screen and satellite radio. This company, Retro Retreats brings the trailer to you, and you just design your event around it. Check out www.retro-retreats.com if your crazy about Airstreams..... Very hip! Like everyone else here I love airstrems, what is it? The love of quality and uniqueness? I am so happy there are other people who feel the same as I do about these. An MP3 compatible stereo, a flat screen satellite TV system, a DVD player and a WiFi Internet connection and who wouldn't want to spend a weekend in one of these. Skönt att vara besöka din blogg igen, har det varit månader för mig. Väl här artikeln som jag har väntat så länge. Jag behöver den här artikeln för att slutföra mitt uppdrag i kollegiet, och den har samma tema med din artikel. Tack, bra aktie.!!!!!!!!!!!!! There are may person searching about that now they will find enough resources by your post..
Tingin ko ikaw ay kanan kapag sinabi mo ito. Hats off tao, kung ano ang isang ubod ng kaalaman sa paksang ito ... asa upang makita ang karagdagang trabaho ng sa iyo.